It is the Stephanie which is featured here but it is just one of a select group of family -managed hotels located in the City Centre. The Schick Group offer a total of five 4* hotels which boast the finest in Viennese tradition. They are: The Stefanie; Am Parkring; Erzherzog Rainer: Capricorno and City-Central. All date from the end of the 19th Century and are very stylishly furnished and equipped (most with air-cond.) They offer a secure level of comfort without the brashness associated with some modern hotel chains. 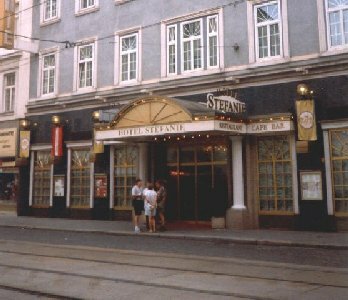 The Stefanie, shown here was named after Princess Stefanie, the wife of Crown Prince Rudolf and has a garden restaurant. Each has its own unique feature - the restaurant of the Hotel Parkring for example, offers roof-top views of the city's cultural centre.